Cerveny Kamen Castle is located in Cerveny Kamen. Using our international travel planner, Cerveny Kamen attractions like Cerveny Kamen Castle can form part of a personalized travel itinerary. We arrived at the opening. We could see we could visit on his way home and still use the Bratislava map. We got the tour, us alone to start with information in English, along with the paper in English about the site. Although there were two Slovak customers with, so would guide good answer us in English. Nice slot. Very nice castle that will let you breathe the atmosphere of far gone centuries. It is kept in a very good shape. Every summer hosting a medieval event called Festival of forgotten crafts. Very good accessible and fit as well for small kids. There is a small winery within the castle walls offering very good wines for purchase. Castle is located in the nice environment. When we were on our guided tour the wedding was held here. I imagine that the wedding feast must have been incredible. I highly recommend this place for visit because you will find out interesting facts from our history. The castle is great by itself, but it's much better to visit it during some event that is usually organized by the museum or some other organization/group. The only downside is the small capacity of the restaurant in the area of the castle and average food. Huge parking areas for cars and busses, possibility to do a little walk or even hike in the nearby forest. It's quite boring for small children by itself, but as I mentioned earlier, they often come up with an event, which is usually very family friendly. Visiting a Bavarian castle on a cold foggy winter morning was not the wisest thing to do. Yet, the drive to the castle from Bratislava was a fine one. 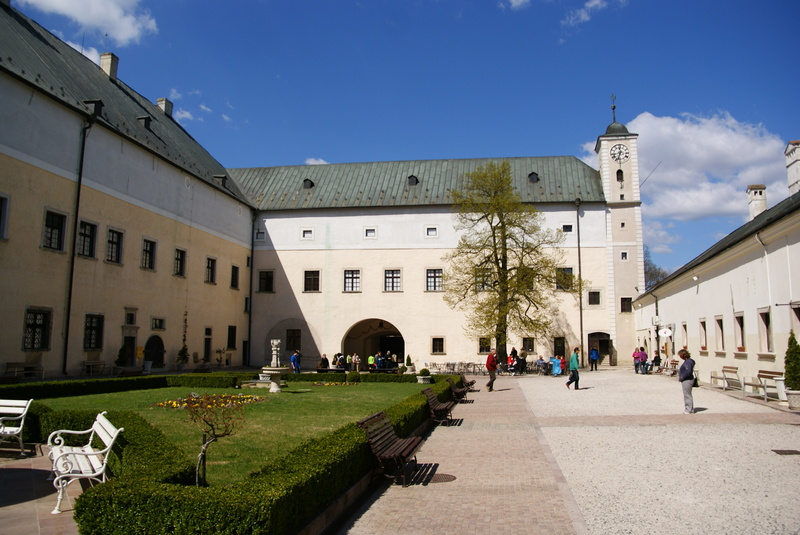 The castle is not very far from Bratislava and it's ample grounds would make it a fine place to visit with children on a warmer day. There was a play on that morning which moved from room to room. Since I didn't understand the language, our guide tool us around herself. Lots of weapons all around with superb furniture. There was a very nice market replicating a local market in years gone by..this was set up in the palace itself and I found some lovely wine there to bring home. About 2 hours is needed to go around the castle, add to it the needed travel time plus the time to stroll around the plentiful and beautiful grounds. My personal highlight of the trip through the region! For one, because there's plenty of various options to keep your family busy (sleeping beauty theatre for kids, birds of prey zoo with a show, guided tours through the castle, and so on) or just enjoy the stay in the courtyard with a drink or snack from the restaurant on site. On the other hand, in the staircase up to the western bastion, there are pictures about how the site looked before restauration started. The place was literally brought back from a devastating state to a nicely polished castle with the support buildings a castle used to have. Definitely worth a trip. Beware of the opening hours in the off-season, though, as you might end up with no guided tours going and thus not being able to enter the rooms. Every day, we help thousands of travelers plan great vacations. Here are some tips on how to use your Listing Page to attract more travelers to your business - Cerveny Kamen Castle. Promote your permanent link - https://www.inspirock.com/slovakia/cerveny-kamen/cerveny-kamen-castle-a1127257213 - on your website, your blog, and social media. When a traveler builds a plan from this page, the itinerary automatically includes Cerveny Kamen Castle. This is a great way for travelers looking for a great vacation in your city or country to also experience Cerveny Kamen Castle. Promoting your link also lets your audience know that you are featured on a rapidly growing travel site. In addition, the more this page is used, the more we will promote Cerveny Kamen Castle to other Inspirock users. For best results, use the customized Trip Planning Widget for Cerveny Kamen Castle on your website. It has all the advantages mentioned above, plus users to your site can conveniently access it directly on your site. Visitors to your site will appreciate you offering them help with planning their vacation. Setting this up takes just a few minutes - Click here for instructions.